Anglo Arms Triple Throwing Knives Set. These are the Anglo Arms Branded Triple Throwing Knives Set complete with a nice nylon case with belt loop. These are the Anglo Arms Branded Triple Throwing Knives Set complete with a nice nylon case with belt loop. 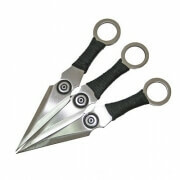 The knives are well balanced and easy to throw. They each have finger loops at the top and a black corded handle. The stainless steel blade have a nice target design in the centre of the blades and the Anglo Arms logo on the reverse. Each measures 6.25 inches (16cm) and weigh 45 grams a piece. Great ! Strong made as I’m throwing them into oak trees with thick bark and I’m yet to bend or break the tip and the pouch it comes with sits nicely on my knife belt. Alot better quality than I was expecting, very sturdy and sharp and with a nice weight. 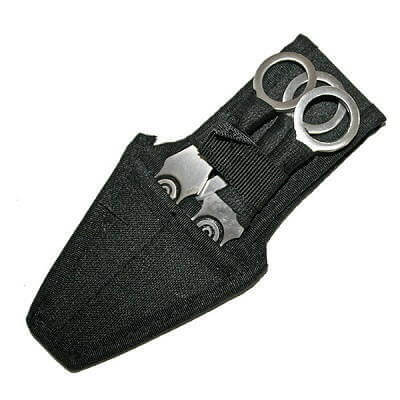 The knife pouch is also of a very good quality. Multi-fold cardboard boxes as target, great knives, well-balanced, now just need to practice! Greatly balanced love the design excellent buy.